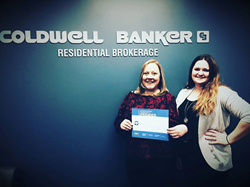 Brookfield’s top producer Jennifer Hupke at Coldwell Banker made the distinguished national list, created by real estate industry website, The REAL Trends, in partnership with The Wall Street Journal. Seasoned real estate broker, Jennifer Hupke of Coldwell Banker has once again been recognized by industry respected resource REAL Trends on their coveted 2017 Top 1000 agents list. Placing at 122, Hupke continues to earn her position as one of Southeastern Wisconsin’s top producer for the sale and purchase of residential real estate in the Brookfield area. With 15 years of experience, Hupke is the only Brookfield based realtor listed on the REAL Trends list and marks the third year making the Top 1000. “I am honored and privileged to work with amazing people and have built a great team of professionals to get the job done quickly and efficiently. In turn, this produces maximum returns for my clients. I treat each property as if it were my own -- and turn transactions into relationships,” said Hupke. Hupke has built long-term trust in her community by going the extra mile with her clients and developing long-lasting relationships that matter. With a full-service approach, she brings simplicity to an often complicated process and facilitates staging, renovations, repairs, photography and much more. Hupke also has a strong reputation for being seen around town being involved with programs that bring a larger sense of purpose to their business, including sponsoring kids’ baseball teams and supporting charities such as Special Spaces, which create dream bedrooms for local children with life-threatening medical illnesses. The REAL Trends Top 1000 ranking is advertised within The Wall Street Journal, and REAL Trends carefully vets agents and their teams based on number of transaction sides and total sales volume. Applications for the top list begin in January of every year and continue through March, with nominees and their statistics being additionally verified by a third-party. Jennifer has experience specializing in foreclosures, short sales, BPOs, and REO properties. Jennifer is a master of her area of Southeastern Wisconsin covering six major counties including: Milwaukee, Waukesha, Ozaukee, Racine, Washington, and Jefferson. As former PD, Jennifer has a fantastic relationship with the community and local municipalities. Jennifer is committed to providing outstanding service and making asset managers shine. She offers four local branches servicing all of Southeastern Wisconsin and has a full-service and full-time marketing department that offers maximum exposure for all of her properties and featured listings in sites such as Trulia, Zillow, and Realtor.com. For more information, call 262-613-2548, or visit http://www.jenniferhupke.com. The office is located at 20350 Watertower Blvd., #100, Brookfield, WI 53045.